You Don't Know Jack begins as 61-year-old former pathologist Dr. Jack Kevorkian (Al Pacino) launches his crusade to provide what he considers to be a humane and dignified option for the terminally ill - assisted suicide. Aided by his loyal friend Neal Nicol (John Goodman) and his older sister Margo Janus (Brenda Vaccaro), Kevorkian begins offering his "death counseling" services to a grateful and burgeoning clientele. He earns the support of Hemlock Society activist Janet Good (Susan Sarandon) and the wrath of the county prosecutor's office. Talented and flamboyant attorney Geoffrey Fieger (Danny Huston) agrees to represent Kevorkian in court at no charge, and Jack is repeatedly exonerated, despite the impassioned efforts of his detractors. As the media catapults him to the forefront of national news coverage, Kevorkian continues his work, assisting more than one hundred patients who end their lives. Provocative, obstinate and complex, Jack ultimately risks it all in his fervor to change the prevailing laws and challenge society's attitude towards the right to die. 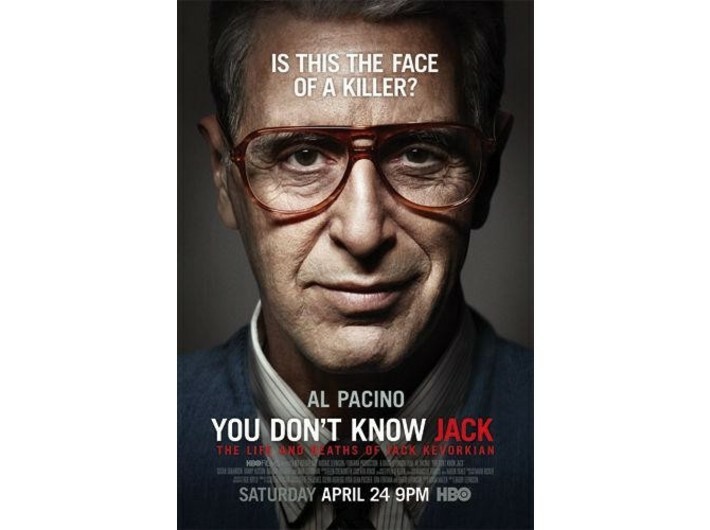 You Don't Know Jack is directed by Oscar® winner Barry Levinson and written by Adam Mazer. The HBO Films presentation is executive produced by Steve Lee Jones, Glenn Rigberg, Lydia Dean Pilcher, Tom Fontana and Barry Levinson, and produced by Scott Ferguson. In English, with Polish subtitles. Produced by HBO.